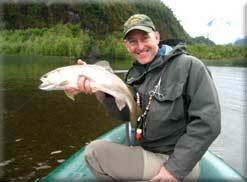 Our mission is to send our clients and friends to the very best fishing areas that Chile and Argentina have to offer. We maintain that our approach will be personable, honest and friendly, and that we will be sensitive to your particular angling interests and abilities. One of our main objectives, through superior customer service & extensive knowlege of both countries, is to maximize repeat business and referrals from satisfied customers. In order to maintain this promise we have partnered with some of the best lodges and outfitters in Patagonia. Thank you for visiting this site. good humor, and easy laughter," Roderick Haig Brown 1952.